You want to live your dream of flying. 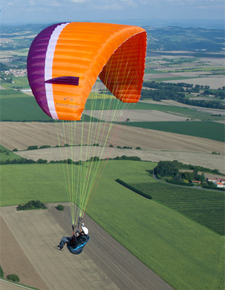 As a beginner or leisure pilot you’d like a paraglider that you can trust 100%. The ALPHA 5 has this essential quality. It is the classic for first flights – and more! This 5th generation of the ALPHA line builds on more than 20 years’ experience of paraglider-making, and includes the latest technology. Light build, easy to take off. This simple formula means that your first ALPHA 5 pull-ups become an unforgettable experience. New Nylon wires hold the leading edge profile in perfect shape. Greatly reduced canopy weight and characteristic ADVANCE semi-circular air intakes make the ALPHA takeoff a simple affair. Analytically designed cross ports in the cell walls make a significant contribution to safety. They improve air transfer across the inside of the wing, so improving passive safety. The ALPHA 5’s compact shape makes it very straightforward to deal with, keeping you feeling good from the moment you get into the air. The ALPHA 5 doesn’t just make your first flights a lot of fun. 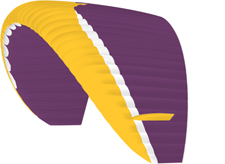 A special design feature is internal diagonal ribs. Together with an optimised line plan this means noticeably better performance and the top speed in the A classification. With the ALPHA 5 you can make real headway in exploring the countryside.